If your dog is experiencing health issues and your veterinarian has suggested you put your dog on a low-protein diet, this post is for you. While high-calorie dog food helps your dog gain weight safely, protein is essential in the daily meals of your pet to improve body tissues such as muscle, hair, collagen, etc., and as enzymes and antibodies. Protein affects the health of your dogs' coat, skin, nails, and muscles. You can easily find protein in raw meat and quality dog food products available on the market. When your puppy is growing, a diet high in protein will ensure rapid growth of build muscle. However, in some conditions, you might need to switch to a low-protein diet or lower the amount of protein in your pet's daily routine due to a few following reasons: specific allergic reaction, symptoms of weak digestion and excessive toxins in the GI tract, urinary stones, liver problems, kidney functions, aging issue, and decreased bodily needs. To determine how much protein your dog needs, you should ask your veterinarian. Your veterinarian may also be able to answer other questions: "can your dog eat vegetable such as beans, red and green pepper?" Here are my 5 top low-protein dog food suggestions to keep your pet healthy and provide enough energy for its daily activities. In spite of high-grade and natural ingredients, some dogs are suffering from food allergies. Holistic Select Natural Dry Dog Food has many ingredients so be sure there are no ingredients in Holistic Select harmful to it. It's best to mix this dry dog food with an ounce of water and stir. Remember that use enough water to coat, not soak them. If not, the pieces of food may slide down the throat without chewing. 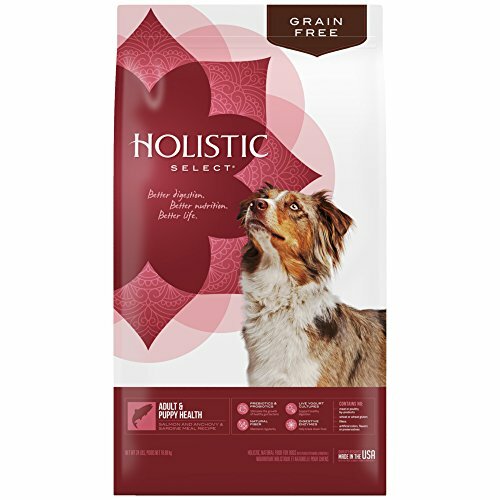 Holistic Select claims to be “the only natural pet food that offers a complete digestive balance system to help your pet absorb and utilize all nutrients.” They guaranteed that the levels of digestive enzymes and botanicals; prebiotics; probiotics; and natural fiber are a perfect blend for your pet. Thanks to the controlled compositions and balanced ingredients, the primary function of this formulae are to support the treatment of problems in the liver and related symptoms. For example, when lowering the content of copper and boosted zinc, the metal buildup in its liver is also lessened. If your dog comes with hepatic encephalopathy, you have to make sure feeding it digestible foods and vegetable protein, carbohydrates in this kind of dog food are excellent. ROYAL CANIN lowers sodium content, so it keeps the blood pressure of your dog at a stable level. It is an excellent source of dietary fiber and B vitamins. You can easily find out omega-3 fatty acids among ingredients which can lessen inflammation. In some cases, dogs may be more energetic than what they should. Thus, you should combine Royal CANIN with other kinds of foods. This combination keeps both its liver healthy and its energy at an average level. 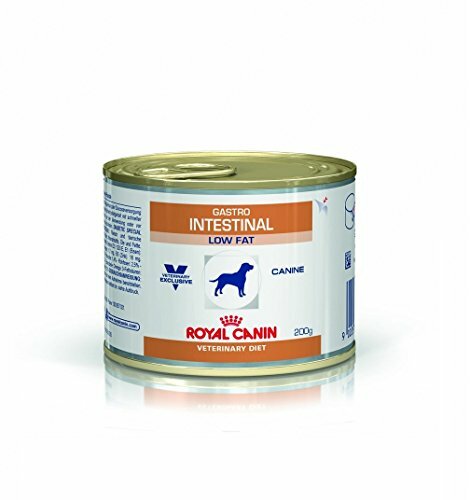 All ingredients in Royal Canin Veterinary Diet Canine Gastro Intestinal Low Fat Canned Dog Food are useful in the reduction of uncomfortable symptoms and treatment of the gastrointestinal health problems. The flavor of Royal Canin doesn't suit with all of the dogs. Although even some picky dogs enjoy it freely, others can't consume unless they are too hungry. Thus, it's best to buy the only one can first then you can purchase more if your dog loves its taste. Specifically, low-fat content helps your dog digest proteins efficiently which produces fewer toxin and lessens inflammation. Meanwhile, low fiber content is responsible for absorption of nutrients as well as possible. The unique blend of antioxidants supports your dog build a good immune system. In case the intestinal tissue or microflora of your dog is hurt, the following ingredients can nourish them: zeolite, fructooligosaccharides, and hydrolyzed yeast. The nutrients: minerals and antioxidants both balance the digestive and intestinal systems of your dog and build strong environmental protection. 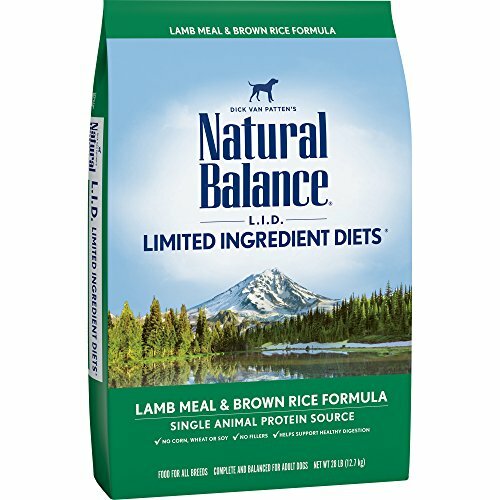 Your vet may recommend the daily diet for your dog by this low-fat canned dog food to supervise its health if it comes with one of the following GI conditions: bile acid deficiency, bacterial overgrowth, exocrine pancreatic insufficiency, oxidative enteropathy, Lymphangiectasia, hyperlipidemia, acute and chronic pancreatitis/ diarrhea. If you are having difficulties in controlling the weight of your obese dog this formulation gives it more energy (12 vibrant superfoods as well as several other nutrients) to be more active. For instance, the high content of vegetable (carrot, tomato, beet pulp, pumpkin, and spinach) is the prevention of fat. The combination of lean meat protein source, fruits, vegetable, and essential oil helps the weight management as easy as possible keeping balanced nutrition without harming to its overall health. If you still hesitate, the manufacturer of Nutro comes from the USA is a good reason to convince you to buy this product. When it comes to Nutro, you have many options to choose from large and small packages to cans of 12.5 ounces. This dog food is made from all-natural, lean, organic ingredients which are produced with the purpose of keeping healthy joints, shiny coat, smooth and light skin, active and healthy heart, bright eyes as well as an excellent immune system. It's free of artificial colors, flavors, preservatives, chicken by-product meal, corn, wheat, and corn. 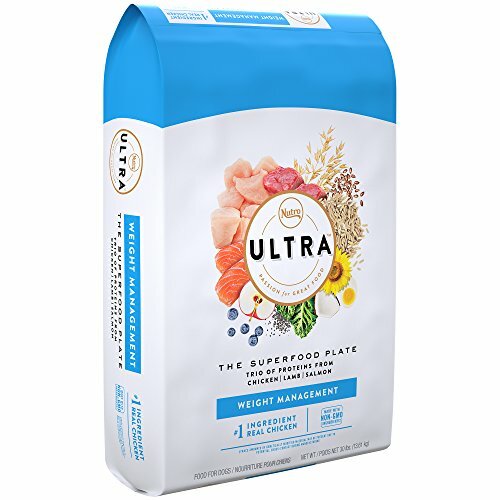 In spite of a high price, this is a worthy investment if you have a long-term plan for the daily meals of Ultra Weight Management Dog Food. Small pieces of this dog food are more suitable for puppies or small-sized dogs than the big ones. This is a kind of the pure and nutritious dog food thanks to formulating limited ingredients: bison meat which is rich in amino acids - the main ingredient making high-quality protein and low calorie; sweet potatoes (premium quality carbohydrate) - an essential ingredient keeping your dog active and providing it enough potassium level. Over time, there are changes in the ratio of some ingredients such as bison meat and sweet potato according to a few long-term users (reduced). However, with some dogs, they don't really pay attention to that change. They just consume this dog food as usual. In general, if you plan diets with limited ingredients, that means you are protecting it away from food sensitivities. It's free of preservatives, colors, and artificial ingredients. Depend on the user demand and your budget, you can choose a dry food pack of 1 - 20 pound. This is excellent support for the maintenance of digestive health, healthy skin, and shiny coat. At the end of the low protein dog food, you may recognize its importance in treating your dog's disease which is related to protein level. And it's more important to choose the most appropriate product to reach as much as benefits without harm the health of your dog. Yet, I personally recommend Natural Balance L.I.D. Limited Ingredient available on Amazon for most of the buyers. Although it's quite expensive, we can consider it as a good exchange. The benefits of this product are proven by the manufacturer through their excellent safety tests which performed by their most professional chemists and microbiologists.